Temperatures are finally set to increase. IT SEEMED LIKE this winter might never end. Just one month ago, the country was blanketed in snow thanks to the Beast from the East. But it still doesn’t feel like the country has warmed up properly. But finally there is some good news – an ‘African air plume’ is on its way, and is set to create a mini-heatwave this week. But what is it, and how hot are things expected to get? What is an African air plume? Put simply, it is a mass of hot air moving up from Africa to meet us. It arrived in Europe yesterday from North Africa, and will move across southern Europe before it reaches the UK and Ireland. As it is a southerly wind, it will be warm. Thus, the 1,500-mile air mass is set to raise temperatures across the country. Temperatures are expected to reach a maximum of 18 degrees. So, while not exactly scorching, the conditions will be “very pleasant”, as Met Éireann forecaster Joan Blackburn told TheJournal.ie. 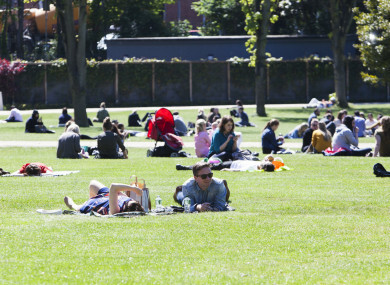 The temperature will hit as high as 16 degrees this week, rising to 18 degrees over the weekend, when conditions should be mostly dry and sunny until the rain starts to creep into the west again on Sunday. But first, we have to face the current wet and windy weather thanks to Storm Irene, which resulted in a status yellow weather warning for the whole country last night. As Blackburn put it, people are”going to have to wait”. The combination of weather conditions means that, before the weekend, we’ll be faced with wet and misty conditions and high temperatures. Today will be a mixture of heavy showers and sunny spells, but there’s good news as temperatures will rise as high as 16 degrees. Tonight looks to be pretty misty, with persistent rain in the southwest towards the morning. Tomorrow will begin misty, with rain in the west and most places dry. The afternoon will be cloudy with sunny breaks, and temperatures will reach 18 degrees. Overall, it has been described by forecasters as “four seasons in a week”. Across the sea in Britain, the temperature is expected to rise as high as 23 degrees in London tomorrow, staying in the 20s over the weekend. As they are futher east, they will have higher temperatures. Email “What is an African air plume - and how high will temperatures get this week?”. Feedback on “What is an African air plume - and how high will temperatures get this week?”.